A wide scoop neckline with a ribbed knit matches the ribbed knit cuffs, waistband and hem of this fun black and white striped dress. The dropped sleeves create an interesting fashion feature by extending the stripe down the shoulder to the upper arm, then continuing the stripe horizontally. The hemline is tapered so that it hugs your legs while shaping your derriere at the skirt. The stripes are knit directly into the fabric in alternating white so that the bottom edge forms a gentle sweeping scallop when seen up close. 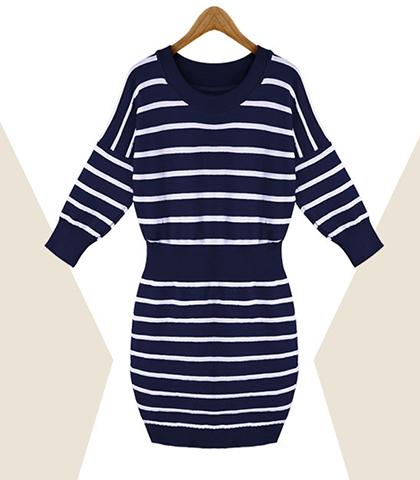 This charming dress is a perfect garment for a shopping trip with friends and enjoying lunch afterward.